The finding was published in Scientific Reports in November of 2018 and the study was headed by Naoto Tanibata, Ph.D., an Assistant Professor at the Department of Advanced Ceramics at NITech. The popular lithium-ion batteries have several benefits—they are rechargeable and have a wide application spectrum. They are used in devices such as laptops and cell phones as well as in hybrid and fully electric cars. The electric vehicle—being a vital technology for fighting pollution in rural areas as well as ushering in clean and sustainable transport—is an important player in the efforts to solve the energy and environmental crises. One downside to lithium is the fact that it is a limited resource. Not only is it expensive, but its annual output is (technically) limited (due to drying process). Given increased demand for battery-powered devices and particularly electric cars, the need to find an alternative to lithium—one that is both cheap as well as abundant—is becoming urgent. Sodium-ion batteries are an attractive alternative to lithium-based ion batteries for several reasons. Sodium is not a limited resource—it is abundant in the earth's crust as well as in seawater. Also, sodium-based components have a possibility to yield much faster charging time given the appropriate crystal structure design. However, sodium cannot be simply swapped with lithium used in the current battery materials, as it has a larger ion size and slightly different chemistry. Therefore, researchers are tasked with finding the best material for sodium ion battery among vast numbers of candidates by a trial-and-error approach. Scientists at NITech have found a rational and efficient way around this issue. After extracting about 4300 compounds from a crystal structure database and following a high-throughput computation of these compounds, one of them yielded favorable results and was therefore a promising candidate as a sodium-ion battery component. The researchers identified that Na2V3O7 demonstrates desirable electrochemical performance as well as crystal and electronic structures. This compound promises fast charging performance, as it can be stably charged within 6 min. The researchers also demonstrated that the compound yields long battery life as well as a short charging time. 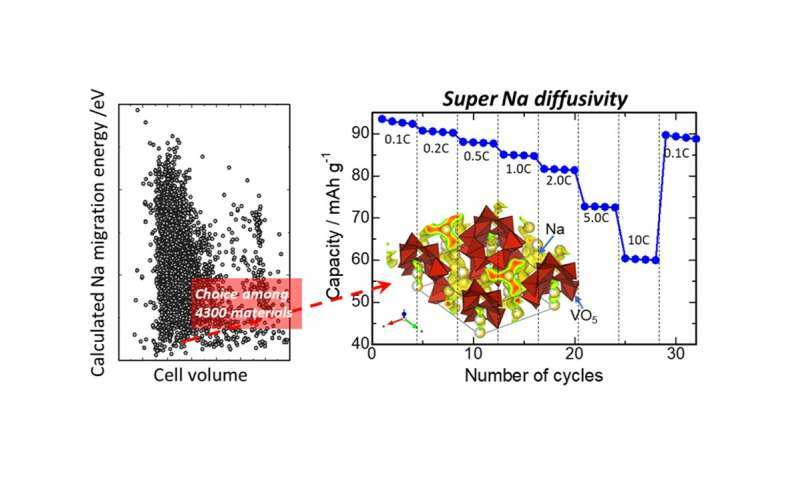 Despite the favorable characteristics and overall desired impact on sodium-ion batteries, the researchers found that Na2V3O7 underwent deterioration in the final charging stages, which limits the practical storage capacity to half of the theoretical one. As such, in their future experiments, the researchers aim to focus on improving the performance of this material so that it can remain stable throughout the entire duration of the charging stages. "Our ultimate goal is to establish a method that will enable us to efficiently design battery materials via a combination of computational and experimental methods," Dr. Tanibata adds. And there's more vanadium in the battery than sodium. Sodium is not a limited resource—it is abundant in the earth's crust as well as in seawater. Lithium can also be extracted from seawater (more expensive than sodium extraction, though). It's the third most common element in the universe. If you really want to you can 'mine' it in your back yard. Cheap Sodium batteries would be great - even if they don't turn out to be energy dense enough for cars. A scaleable solution for large scale grid energy storage is sorely needed. They should forget about both lithium and sodium batteries and concentrate their research on fully developing magnesium-sulfur batteries that promise to have MUCH higher energy densities than either lithium-ion or sodium-ion batteries. Both magnesium and sulfur are relatively cheap and fully recyclable we will never run out of them. Or, just use a fuel cell. Best energy density, no chance of spontaneous combustion due to battery chemistry. They should forget about both lithium and sodium batteries and concentrate their research on fully developing magnesium-sulfur batteries that promise to have MUCH higher energy densities than either lithium-ion or sodium-ion batteries. I'm thinking fluoride batteries hold most promise (simply because of the electro-negativity of fluorine and the size of the atom involved). From a chemistry/physics standpoint that should yield the highest energy density possible. Vanadium is as common as copper. It's used in strong steel alloys, and in fact was used in the steel for the Model T Ford.